Form•Z v8.0.2 has been released. Updates are available for form•Z pro, form•Z jr, form•Z free and the form•Z Student Edition. You can update your software by selecting Check for Updates in the Help Menu in form•Z and following the prompts for downloading and patching. Details on what’s new in this version can be found here. formZ / bonzai3d + Maxwell Render Promo Bundle! Don’t miss out on this amazing bundle, available until the end of July! 30% off full licenses of formZ / bonzai3D and Maxwell Render and 20% off upgrades. All purchases will also receive a FREE upgrade to formZ 8 when it’s released! 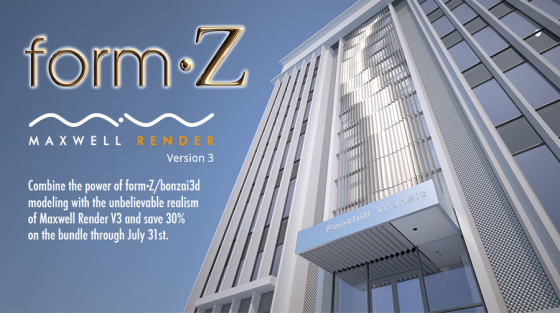 Purchase your formZ / bonzai3d + Maxwell Render Bundle now! AutoDesSys invite you to join them for this webinar on the organic modelling capabilities in form•Z 7 and bonzai3d. They will demonstrate the suite of NURBS tools and how they can be used together to explore, design and deliver a solution. Any design professional who needs an intuitive, easy to learn, yet extremely powerful set of NURBS tools to accomplish organic modeling tasks will be interested in this topic. This webinar is loaded with numerous tips and tricks to assist you in creating complex NURBS shapes faster and easier than you ever thought possible. You’ll be amazed how you can use organic forms to enrich your designs. A question and answer session will follow immediately after the webinar. Space is limited so reserve your place now for this informative and exciting webinar. Next Limit Technologies, creators of Maxwell Render and AutoDesSys, developer of bonzai3D, recently announced a new plugin for bonzai3d users. The new plugin will now allow bonzai3d users to render with Maxwell Render directly inside their platform. With this plugin, users can convert materials between the two programs as well as view Maxwell materials directly inside bonzai3d.
? ?We are excited to see this new connection between Maxwell Render and bonzai3d,?? says Juan Ca?? ?ada, Lead Developer of Maxwell Render, at Next Limit Technologies. ? ?The integration is exceptional and it will offer bonzai3d users an opportunity to produce the best quality images using Maxwell Render??. B3d is a relatively new comer in the? 3D industry. It is quick, easy to use but quite powerful and very robust. Designers can use b3d in the conceptual and sketching stages of their projects workflow. The CAD accurate models can then be used further down in the pipeline for final renders, construction design, fabrication and animation. Embedded tutorials make it easy to use while its robust geometry standards make it a choice for professionals.
? ?We are very pleased with the release of the Maxwell Render plugin for b3d, as it will add some great advanced rendering capabilities to the refreshingly easy to use modeling flow of the program?? says Alexandra Yessios, VP of Sales & Marketing at AutoDesSys Inc. ? ?You can create imaginative forms smoothly and effortlessly and then render them with all the global illumination effects that so successfully compete with reality.?? “We kept bonzai3d’s motto— ‘small but powerful’— in mind when developing the plugin for Maxwell Render? ?, says Ben Dean, plugin developer. ?? You’ll get photorealistic renderings from your existing Bonzai projects in no time with the materials auto-translate feature, which uses verbal material hints, like ‘glass’ and ‘aluminum,’ to guide the translation. Of course, you can use MXM materials for even greater accuracy. The plugin adds five new light types for illuminating your scenes, including Maxwell’s Physical Sky, IES for manufacturer-accurate lighting, and a parametric ‘soft box’ which works just like its photographic counterpart. These light types help you leverage Maxwell Render? ?s legendary Multilight feature. You can promote your designs with stunning, physically accurate images ?? Maxwell Render is a next generation rendering technology based upon the physical equations governing light transport. It enables users to digitally create highly accurate and believable imagery of the real world. Maxwell Render produces incredibly realistic illumination without resorting to the tricks/approximations used by many current industry standard renderers. Moreover, it supersedes existing renderers through its incredible ease-of-use, enabling professionals in a very broad range of disciplines to quickly learn and exploit its capabilities. Maxwell Render is now used as the render software of choice for companies in many industries including Architecture, Automotive, Product/Industrial Design and Media & Entertainment. Bonzai3d offers a fresh take on 3D modeling. Prior to b3d, 3D modelers tended to be easy-to-use, or accurate and powerful, but rarely both. Bonzai’s fluid, contemporary interface is backed up by robust geometry based on AutoDesSys’ proprietary modeling algorithms coupled with other solid modeling kernels, so you can go from 3D sketch to production in record time, with solids, NURBS or both.